In the first part of Profit and Loss series, we learnt the basic definitions and the meaning of Cost Price, Selling Price, Marked price etc. Let us revise the definition of Marked Price. As we saw earlier, traders are in the habit of marking their articles at a certain price above their costs. Then the discounts they offer are on this marked price, thereby they actually make sure that have already factored in the profit they want. Example-1: Natasha offers her customers a discount of 10% on her beauty products and she still makes a profit of 20%. What is the actual cost to her of that beauty product marked Rs. 400? If you look at the above formula closely, you would see that the multiplication is nothing else but a percentage equivalent of two successive percentage change on a number. Example-2: Pankaj offers a 10% discounts on his goods and he offers a further discount of 5% on the reduced price to those customers who pay cash. What does a customer have to pay in cash for a cricket bat of Rs. 200? Example-3: The cost price of 30 articles is equal to the selling price of 40 articles. 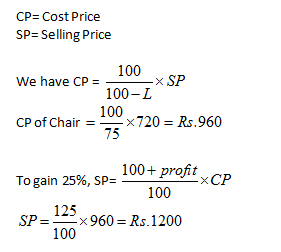 What is the profit or loss percentage? To obtain the same amount of money, which was needed to purchase 30 articles, we need to sell 40 articles, which is more than what we have got for the same sum. It means we need to arrange 10 more articles apart from the articles which we have purchased. So, there will be a loss. 1. First one is sold at a profit of x% and second one is sold at a profit of y%. 2. First one is sold at a profit of x% and second one is sold at a loss of y%. 3. First one is sold at a loss of x% and second one is sold at a loss of y%. 4. First one is sold at a loss of x% and second one is sold at a profit of y%. Let the cost price be Rs. 100. The goods are sold at the discount of 12%. The advertising price is basically the marked price. I like way of your explanation. Send all the difficult and different types of problems.